Make your mornings a blast with the "Complaint Department" Grenade Ceramic Mug from Fairly Odd Novelties! This explosively funny mug is perfect for your morning coffee, tea, cocoa, or other hot beverage, and is sure to let everyone know to keep a wide berth! Pull the pin on boring mugs! Make your mornings a blast with the "Complaint Department" Grenade Ceramic Mug from Fairly Odd Novelties! This explosively funny mug is perfect for your morning coffee, tea, cocoa, or other hot beverage, and is sure to let everyone know to keep a wide berth! 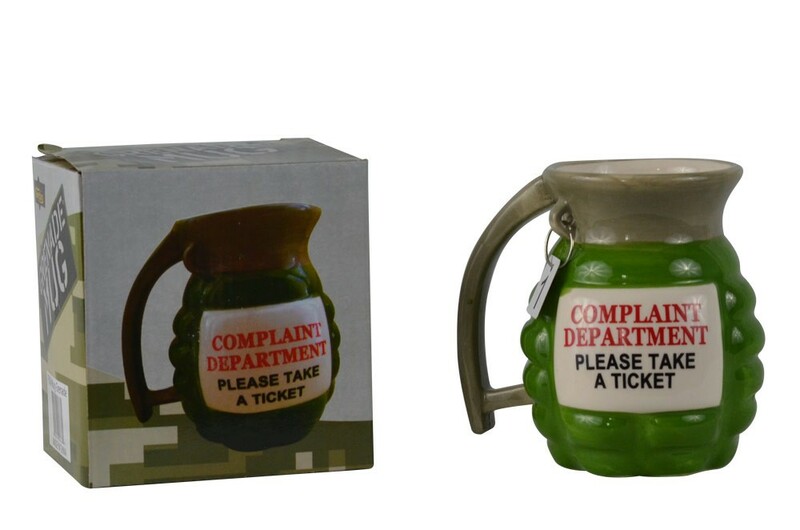 With its authentic grenade design and looks, this mug will appear to any military enthusiasts, while its "Complaint Department" tagline will make any comedian chuckle with delight. If you're ready to blow the roof off of your next birthday, white elephant, office, or secret Santa party, then this makes the perfect gift. Order yours today and get ready to pull the pin on boring mugs! Mug is green in color, made of ceramic, and holds 12 US fluid ounces. Dishwasher safe.